Keeper Adventure Tour - All Aboard! Keeper Adventure Tour – All Aboard! Bison grunt and snort. A caribou calf nurses noisily, its mother calmly munching on grass. The sweet scents of the meadow mingle with more earthy smells as herds of animals pass by. And Northwest Trek Wildlife Park guests are amazingly in the middle of the action, getting closer to the animals of the Free-Roaming Area than ever before aboard a specially equipped Jeep. They’re on a brand new Keeper Adventure Tour. This intimate experience, which takes wildlife park guests on the paved roads rarely traveled, on gravel tracks and occasionally even off-road, opens to the public on Thursday, July 26. 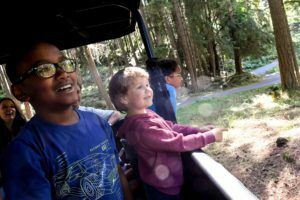 “We are very excited to introduce this new, premier experience to our guests at Northwest Trek,” Metro Parks Tacoma Board of Commissioners President Andrea Smith said. The tour Jeep gets in among the bison herd – an off-road experience you only get with this tour. 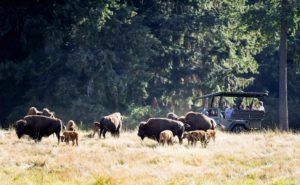 On a recent tour, Northwest Trek keeper/driver wheeled off the road and positioned the four-wheel-drive vehicle within about six feet of the bison herd, which was peacefully grazing in the grass. Seven bison calves were spread out around their parents, many of them lying down, their distinctive orange fur very visible in the tall vegetation. One calf nuzzled its mother, wanting to nurse. Bison grunts were easily heard, and the pungent odor of animal musk mingled with the sweet scent of grass. A few minutes later, Edwards turned off a small paved track and headed out across the grass again, this time maneuvering within about 40 yards of the large Roosevelt elk herd. Every member appeared to be grazing on a knoll – 23 cows, seven calves and 12 magnificent antlered bulls. “Oh, look at the babies!” Edwards exclaimed, pointing out this year’s elk calves, their hides still carrying their juvenile spots. The calves bobbed and weaved among their parents, and the entire herd appeared as if it were posing for a photo op. Meeting keepers like Dave Meadows is a big part of the Keeper Adventure Tour. Leaving the elk herd behind, Edwards soon drove slowly by a lone bison bull, standing so close to the side of the road that one guest exclaimed: “Look at his beard! It looks like he dyed it orange!” The bison lazily chewed on a bit of grain, oblivious to the gaping guests. The shaggy tufts of hair just below his mouth did, indeed, look orange, as it was chock full of droppings from nearby trees. A bit later, she pulled up to a secluded patch of forest and quietly pointed to the right. 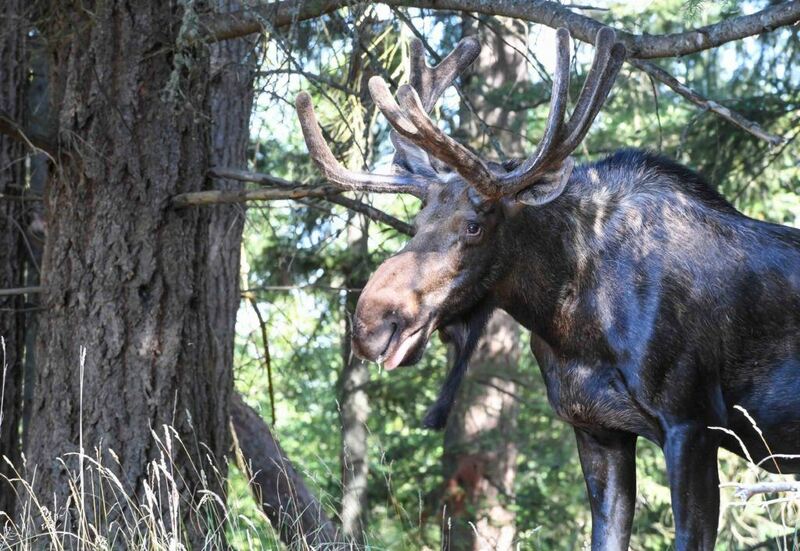 There, four moose stood munching on browse, or tree leaves and branches. The antlered bull occasionally pulled up one of his very long legs to scratch his head, somehow keeping his balance on what looked like an impossible three-legged stance. As if on cue, one of the fawns appeared a short distance past the nose of the Jeep, and the doe and her other fawn scampered through the forest on the left-hand side. 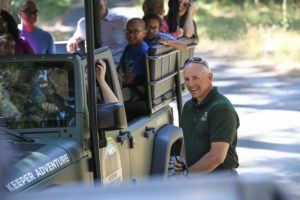 The Keeper Adventure Tour program arose from the creative vision of Northwest Trek staff members, who are constantly seeking opportunities to better connect the wildlife park’s guests with animals. When they surveyed Northwest Trek’s smaller, less-traveled roads, gravel tracks – and even an old logging path – they knew all the ingredients were in place for a first-class, premium tour. Ellis the moose, seen close-up from the Jeep. Meet the Mountain Goat Kids! Bear cubs, eat your veggies. Grizzly cubs make their debut!